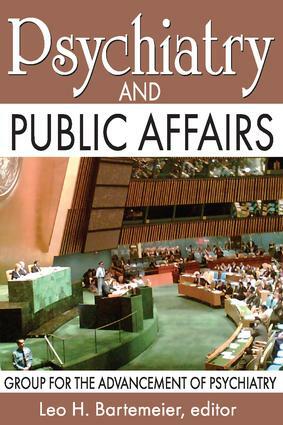 This stimulating collection bears witness to the insight that psychiatrists, with their special training and background and concern for human relationships, can contribute solutions to major problems of public affairs and public policy. The contributors represent the summation and distillation of the best thinking of psychiatry's leaders. They represent a variety of experiences and viewpoints, making possible a many-faceted approach to problems of national and international concern. Based on completely documented reports of individual members and symposium discussions, Psychiatry and Public Affairs examines four major areas of public interest: the social responsibility of psychiatry, emphasizing the psychiatric aspects of school desegregation; psychiatry's role in international relations and understanding cross-cultural communication and working abroad; studies of forceful indoctrination or "brainwashing" and the social and psychiatric implications of the threat of nuclear war. Contributors and contributions included here are "Physical and Social Isolation," Jack Vernon; "Psychiatric Aspects of Chinese Thought Reform," Robert J. Lifton; "Patterns of Reactions to Severe Chronic Stress in American Army POWs to the Chinese," Edgar H. Schein; "The Coming Struggle for More Responsibility," Pare Lorentz; "Some Implications of the Fall-Out Problem," Maurice B. Visscher; "Psychological Aspects of the Nuclear Arms Race," Franklin C. McLean; "Solitary Confinement," Milton Meltzer; and "Sleep Deprivation," David Tyler. Psychiatry and Public Affairs explores ideas and problems on the advancing edge of psychiatry.